Every day I start my day with a walk to Whisker City. And every day I'm reminded of just how much we lost when the killer entered our world. He literally ripped our peaceful routine to shreds and left us with a mess of emotions and new unwelcome responsibilities. Gone are the days of letting good people come and go at will and the cats enjoying outdoor enclosures 24/7. We lost the living space of our three cute and comfy little cabins for cats and kittens and disassembled the attached enclosures. Quixote's cabin has been remodeled and memorialized with donated time and supplies by the owner Lindsey Mueller of Sound Painting Solutions and her friends. The blood is painted over, new shelves hold boxes where he once slept, food and toys are now where he once played. I can still see him standing in his enclosure and rubbing his fur on the wire beckoning a volunteer to come sit with him. Quixote loved being held and petted and talked too and he talked back. He was a special being. I have a lot of regrets from the minute Erin discovered his body in the dumpster until today. Writing this blog may be a mistake, I just don't know, but the advice I got from the police and friends and family was all bad advice looking back. The police asked us not to interfere with the investigation so we didn't. A close lawyer friend echoed the detective's warning, she said, "the detective won't tell you anything and then one day he'll make an arrest. Be patient...". So we didn't interview our neighbors and we didn't track down every lead we got. We passed all our suspects and suspicions on to Detective John Hawkins for him to follow up. Turns out the detectives and the police didn't followup. So my lawyer friend was only half right. The detective didn't tell us anything and then closed the case. Turns out his closing of the case was a good thing. That move allowed us to see the police reports. Those reports combined with the evidence gathered organically confirmed what I knew to be true on September 19, 2017. I know who killed Quixote. The images from that day will never go away. Having been forced to conduct our own investigation required that I examine the blood spatter, measure the bloody boot marks, store his bloody chair and read and decipher DNA reports. Erin's memories are far more gory. We hired a DNA specialist to fly up from California and conduct another autopsy. Erin video taped the gruesome disections. I've never watched that video and I don't want too. Quixote had two autopsies - two reports detailing his injuries and his dying process. Limp and defenseless from the first blow and throughout the breaking of all his major bones, he finally died from choking. A hearing witness said the noise lasted off and on for 15 minutes. The only way to interpret such a lengthy beating can only mean he was alive throughout as the autopsies both indicated, one believing Quixote organs were still alive when he was in the dumpster. Erin and I spoke to Detective Hawkins five days after the murder at our request. Neither one of us had yet to be interviewed. I finally spoke to my neighbors and none of them had been interviewed. No local businesses had been interviewed. None of my neighbors were asked for video footage. No flyers were passed out with the exception of the hundreds our desperate volunteers circulated. Reading through the police reports was proof there really was no investigation. Our peaceful coexistence destroyed and no resolution. My guess is Quixote's murder will not even be counted as an unsolved violent crime and listed as nothing more than a property crime. I feel this way because the police made me feel this way. Quixote's killer walks free to kill again until he's stopped - by us. 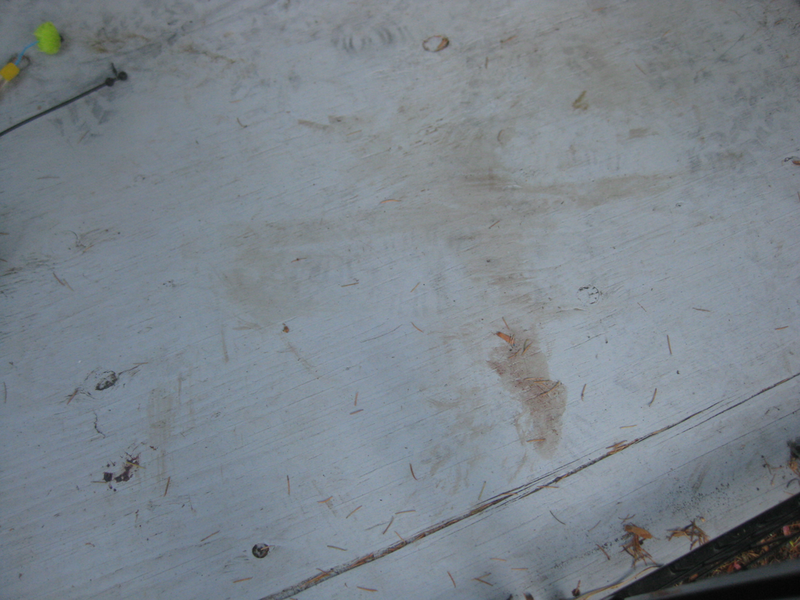 Boot prints and the outline of Quixote's body on the outdoor enclosure deck. Note: Whisker City has retained animal rights attorney Adam Karp. We are currently pursuing a civil action against the killer. The name(s) will be released at the appropriate time by Adam Karp. Quixote's Killer - Will He Kill Again?